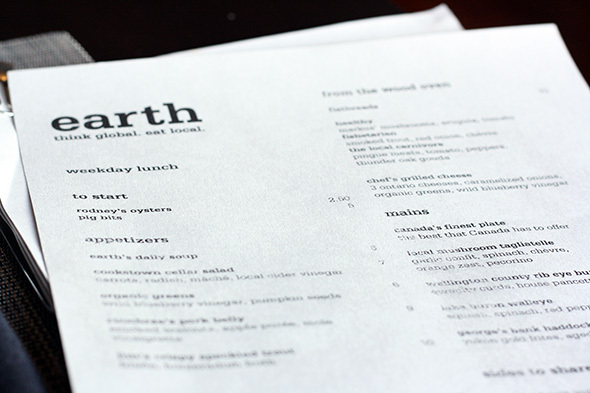 Globe Earth Bistro (or simply "Earth") is the latest restaurant from the people behind the Danforth's Globe Bistro , and it wears its earthiness on its sleeve. The menu is local, simple and straightforward, but with enough refinement to justify its Rosedale location (and Rosedale prices). I headed down for lunch, hoping the people behind Earth had worked out a formula to succeed in a beleaguered location that has seen a seemingly endless parade of restaurants (1055 Plakutta, Tabla, Roxborough's, etc.) try their luck and fail. 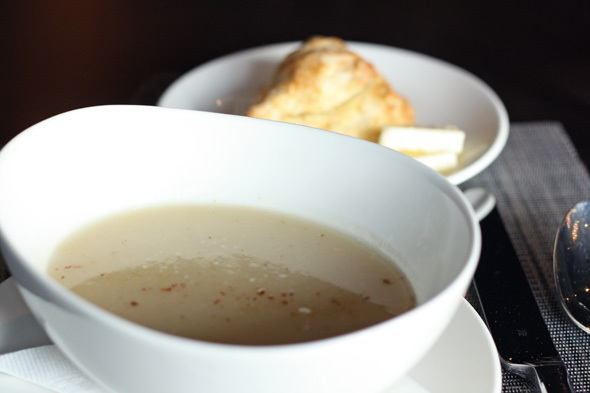 I started things off with the soup of the day, a celeriac and apple cider puree with chili oil ($6). I'm not sure this says good things about my lifestyle habits, but the first thing that popped to mind when I got a whiff of aromatic celery and chili was "Bloody Caesar". The soup itself was perfectly smooth, but didn't have much punch in terms of flavour. On the upside, it was served with a buttery, flaky, delicious scone. Next up, I couldn't help but try the mysteriously titled "pig bits" ($5), listed as such on the menu without elaboration. 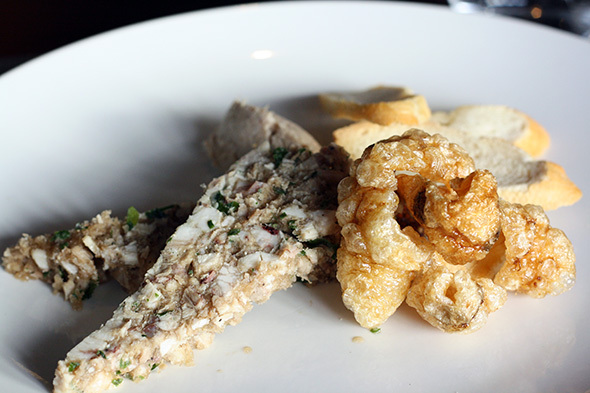 Turns out it's a variety of, well... pig bits: crunchy fried pork skin, a coarsely chopped terrine, and cretons, served with crisp bread slices and whole grain mustard. The terrine was earthy and rustic, and the fried pork skin was crisp and light enough to make me forget I was eating deep fried pork skin . The cretons (spiced Quebecois pork pate) was deeply smoky and rich - definitely the best of the bits. For my main, I decided to roll the dice and go with "Canada's Best Plate", a rotating special that executive chef Kevin McKenna (also of the original Globe) hopes will highlight the best of what's available across Canada at any given time. 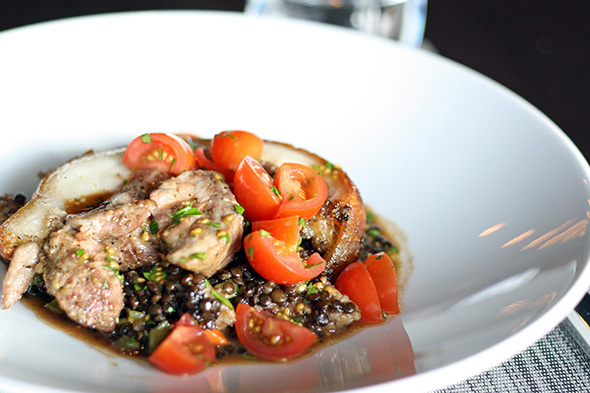 When I visited, that meant pork tenderloin served over a beluga lentil and sausage ragout with macerated cherry tomatoes ($15). Unfortunately, this is where my lunch went off the rails. The ragout was fine, and the sausage was downright tasty, but the pork was a mess. It was served with pork skin so tough and overcooked that I couldn't physically cut through it with my knife, despite some rather un-classy stabbing and sawing motions on my part. The pork itself was cooked extremely unevenly - dry and tough on the outside, worryingly dark pink on the inside. Definitely not Canada's Best Plate. 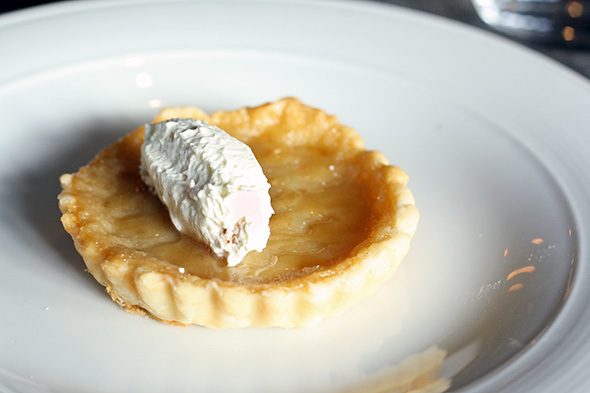 The dessert menu features a variety of Ontario cheeses, along with bistro standards like panna cotta and sugar tarts. Since I already had a pretty consistent "pig" theme going, I tried the maple sugar tart with bacon cream ($6). The tart was well done - sweet but not cloyingly so - but the bacon cream just obliterated any semblance of "dessert" from the dish, conveying all of the fatty smokiness of bacon with none of the salt, which might have been a nice contrast. Globe Earth Bistro has a menu full of interesting ideas, and it's still relatively early days for the restaurant (it opened in late fall of 2009), but it's clear there's some work to be done. Hopefully with a bit more time they can address their execution issues and bring some longevity to 1055 Yonge Street.